Bill 'n' Will, Will 'n' Bill, Bill 'n' Ben the flower pot men!!!! Luckily, despite the name on their licences, Bill Binney and Will Wheeler were happy to be called by their nick names – it could have got a bit messy otherwise!!!!! 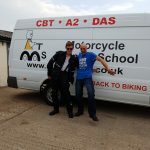 So all the way from Brighton for Bill, and across the forest for Will, and both are now the proud owners of full bike licences, well a second time round for Will (not Bill!!!) as he chose to upgrade from A2 to DAS on one of our Yamaha MT07’s. And just to ease any confusion, each had a different coloured motorbike for their course too. So man hugs all round as the celebrations commence -well done fellas, now keep riding safe!